Ornamental grasses add texture, form and movement to any garden design. Easy to grow, these versatile plants can be found everywhere from flower beds to borders. With just a little maintenance you can keep them adding interest to you garden for years to come. Cool Season Grasses – Varieties like Fescue, Purple Moor and Blue Oak like the cooler temps of spring and fall. They go dormant during the summer heat. Plant them in the early spring. Warm Season Grasses – These plants prosper in summer and early fall. Hardy Pampas and Fountain Grasses can grow all the way until the first snow. Plant these in the late spring or early summer. Evergreen Grasses – These “grasses” actually have many grass-like traits. Sedges and Rushes are in this class. Because these varieties are never dormant, your best bet is to plant them in the spring to allow for stronger root development. Which Grass Do You Have? Ornamental grasses are either clumping or running (rhizome forming). Clumping grasses keep to themselves in nice mounds but do need to be divided to stay healthy. Running or rhizome grasses send out growth below the soil surface. They, too benefit from dividing. Some varieties can be very aggressive and will take over a flower bed if left unchecked. Depending on how neat you like your winter garden, ornamental grasses can offer interest to your yard, so consider leaving the foliage. Birds are attracted to the seeds, and frost can turn stalks into icy sculptures. The dead foliage helps to insulate the crown of the plant. Cut the plant back to about 4-6” in the early spring to encourage and speed up new growth. Avoid drastically cutting back the plants to avoid wounding them. 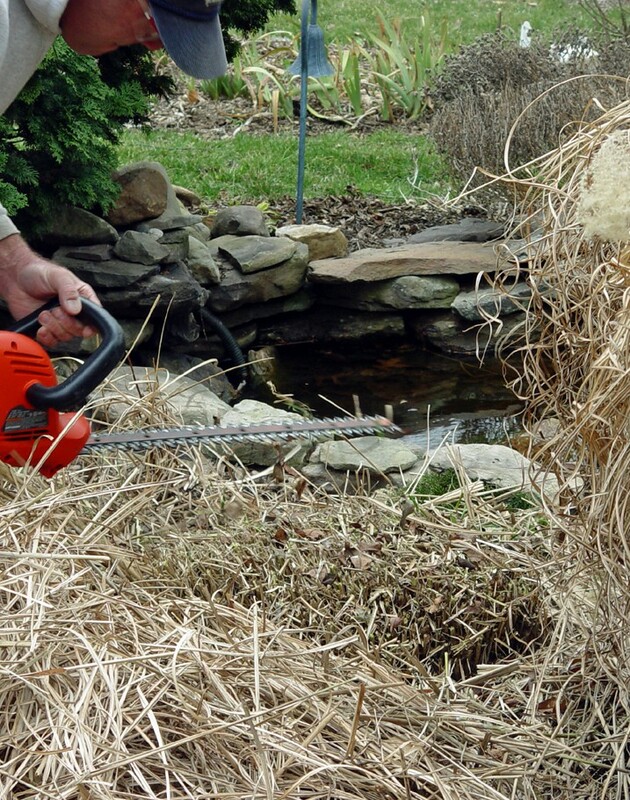 Still wanting to trim your grasses back in the fall and winter? Be warned – maintaining ornamental grasses can be both easy and treacherous. Many species have very sharp foliage, so we recommend wearing a pair of sturdy leather gloves when attempting to cut them back. If the grass mound is large and established, then bundle the stalks together before cutting them. You will need a hedge trimmer or even a chain saw depending on the size of the plant. Deposit the handy dandy bundle of debris in your compost pile. Lift and separate – For large clumps take a small ax or a sharp shovel and partition the crown of the plant into sections. You may need a crow bar to pry apart the pieces you have cut. Leave roots on each of the pieces, but plant them before roots dry out. Shape it up – If you just want to rein in a mound from getting too large, trim around the outside of the plant. You can insert a sharp spade or shovel along the edges and separate sections of the grass away from the parent plant. Be sure to cover up the exposed edges with fresh dirt and mulch. When the center dies – Older plants tend to die off in the center. One method is to break up the entire mound and re-plant some of the divided sections back in the original spot. Another is to “core out” the center of the plant and allow the surrounding healthy growth to fill in the bald spot. Ornamental grasses can break up the monotony in any garden. Just remember when tackling your fall yard cleanup, a little TLC can go a long way in helping your plants stay healthy and ready to put on a show next spring. Our expert staff is always on hand to help you with your lawn and garden projects. From hedgers and chain saws to shovels and wheelbarrows, if you have any questions about what to choose, pricing or how-to’s, don’t hesitate to contact us. Stop by our store — we’re open seven days a week. Having a flooded basement is one of the worst fears a homeowner has and it’s a costly one. It only takes a heavy rainfall or a broken water pipe to ruin everything in the lower level of your home. One item that can alleviate this anxiety is a sump pump. Which Type of Sump Pump Do You Need? Pedestal – This type has the motor mounted above the sump pit and is less expensive. They can last 25-30 years but take up more room and cannot handle debris. Submersible – The motor is submerged in the sump pit, which makes it less accessible. These pumps last 5-15 years, are best for tight spaces and can take up debris without clogging the pump. Ejector – These are good for crawlspaces with pea gravel floors. Constructed from cast iron, these pumps last between 5-10 years and can eject small debris as well as water. Before you begin to dig the sump pit (the hole in which the pump sits), know where your main water and power lines are. It is recommended that you buy your sump pump and the heavy plastic pit liner together to assure proper fit. Once you determine the lowest point in your basement, we are ready to begin. Place the pit at least 8” away from outside walls, but close to a GFCI (ground fault circuit interrupter) electrical outlet. You need to plug directly into outlet. No extension cords please! Dig a hole that is 3” wider than the liner and 6” deeper. You will need to jack hammer the foundation floor in order to clear the way for digging. Line the pit with gravel at the bottom and tamp. Place and level the liner inside the pit and fill around it with more gravel. Attach the discharge pipe to the pump and place it in the pit, making sure to keep it level. The discharge pipe is usually made of PVC pipe and will run from the pit to the outside of the house. A common method of getting the pipe outside is to drill into the rim joist. Dry fit all pipes together and then cement. Discharge pipes should have a small vent hole to prevent an air lock from forming. Be sure to caulk around the pipe, exiting through the rim joist. Dig a hole about a foot deep for the discharge line to exit through. Fill the hole completely with gravel to keep the line from freezing. Support the PVC pipes by attaching them to walls or other joists. Adjust the float valve on the pump and test. Pour water into the pit until the pump is submerged. Plug the pump in and voilà! Water is exiting the building. Put a cover or lid over the pit to help keep debris from getting into the pump or it becomes a hazard. You should consider buying a pump that has an alarm and a battery back-up. Both would come in handy during storms when water is likely to be a problem. For frequent flooding problems, you may want to consider having two separate sump pumps just to cover you in the event the first one fails. It is a good practice to test your sump pump twice a year. Just fill the pit with water and turn the pump on. Regular inspection of the pump will help you avoid any issues. To learn more about some of the potential problems you can face check out our blog on repairing sump pumps. 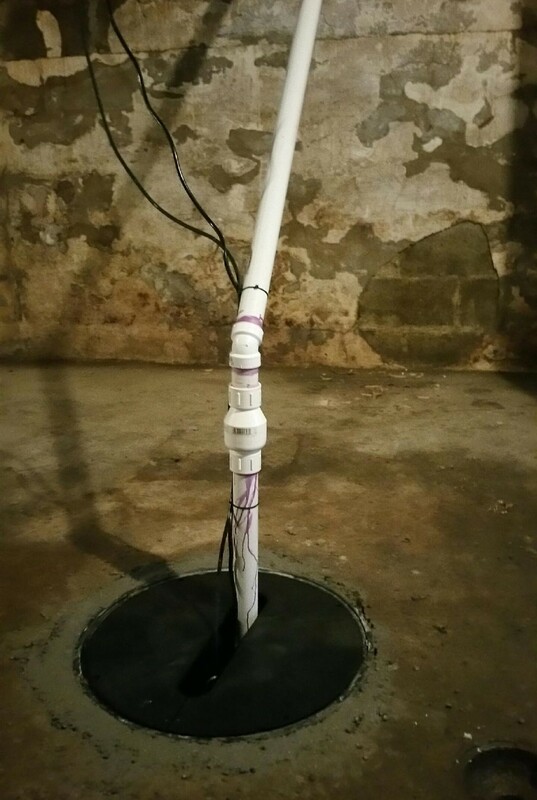 You no longer have to worry about a flooded basement with a sump pump. This simple DIY project will help keep your home safe and dry. So sleep easy and listen to the rain. You’re in good hands. Our expert staff is always on-hand to help you with your DIY projects. From jack hammers and drills to shovels and tamps, if you have any questions about what to choose, pricing or how-to’s, don’t hesitate to contact us. Stop by our store — we’re open seven days a week. Do you know the condition of your grass? Looking out over the yard at all your hard work, it is easy to miss what’s right under your nose (or should we say feet). The long hot summer was likely brutal on your lawn. A good feeding of fertilizer will give you a head start on greener, healthier grass come spring. Before you apply fertilizer to your lawn, it is always good to take a closer look at your grass and soil. (By closer we really mean dig out a small section of your grass and look at the root system.) How deep are the roots? Is there a layer of dead organic matter (thatch) thicker than a half inch below the surface? Is the soil hard and compacted? All of these conditions can be solved by following a simple fall lawn checklist to improve your grass. Keep Mowing – Your grass is still growing and storing nutrients, so don’t put the lawn mower away yet. Adjust the height on the mower to cut the grass shorter. This allows more sun to reach the crown of the grass. Be careful not to trim off more than a third of the blade, which could expose the roots to disease and pests. Keep Watering – Grass is gathering nutrients and moisture to channel into root growth. Cutting back on watering now will cause the roots to remain shallow. A good deep watering of an inch every few days will work. Aerate – Aerating machines extract plugs of soil from you lawn, allowing water and organic material to get to where it is needed. It will improve compacted soil and bring beneficial microbes to the surface. They love to munch on thatch! Our article on aerating has more helpful tips to get you started. Dethatching – If aerating doesn’t completely eliminate the thatch, then rent a dethatching machine, which will pull it up from the soil. Rake up the thatch debris and deposit it into your compost pile. For more information, check out our article on dethatching. 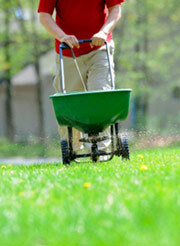 Fertilize – After aerating, spread a layer of compost and fertilizer over your lawn. In the past, many advised applying a fertilizer high in phosphorous. Today that practice is discouraged and fertilizer companies are working to eliminate chemical phosphates due to the harmful effects on our environment. Opt for organic phosphorous sources like fish or cattle bone meal, animal manure or bat guano to help give your grass strong roots. Many lawn problems begin with the condition of the soil. Have your soil (the soil sample you dug up from your grass) professionally tested for PH levels. A healthy lawn will have a PH level between 6.0-7.0. Weeds thrive in acidic soil. A thin layer of lime applied to your lawn should take care of them. Go back to where you dug up your soil sample. Can you see how deep the good top soil is? A 4-inch layer of top soil will give you a good lawn, while an 8-inch layer of top soil will provide you with a great lawn. Good gardening begins with good top soil. Compost and other organic matter worked into your grass with a rake will improve the dirt beneath. Know the difference between organic and synthetic fertilizers. Organic fertilizers are less concentrated, but remain in the soil longer. They release nutrients over time. Synthetic fertilizers are more concentrated and get into the plant faster. They are water-soluble and have a tendency to leach out of the soil quickly. While synthetics get the job done fast, they can burn the plant and get into the groundwater. Help your grass store up the moisture and nutrients it needs to make it through winter. Giving it a boost with fertilizer now will help establish a strong root system and crowd out those pesky weeds. Investing a little time now will pay off big come spring next year. Our expert staff is always on hand to help you with your lawn and landscape projects. From aerators and dethatchers to rakes, if you have any questions about what to choose, pricing or how-to’s, don’t hesitate to contact us. Stop by our store — we’re open seven days a week. Autumn brings to mind crisp clear evenings, warm apple cider, beautifully colored trees … and raking all those leaves, the quintessential fall to-do. We’ve got some creative solutions for your leaf management that will help green up your landscape for the spring. Closing your eyes and wishing the wind will blow them away will not work. If left on your grass, leaves will literally smother your turf. Diseases will take root. Realize that dead leaves are actually manna from heaven for your lawn. Eighty to ninety percent of a plant’s nutrients are stored in the leaves. When they decay, the nutrients return to the soil. Ah, that got you thinking! Every year, more and more, yard waste ends up in American landfills, and that includes leaf matter. The fortunate fact is, this can be alleviated with leaf management. Its goal is to repurpose leaves in a way that benefit your lawn, flower beds or vegetable garden. Learn The Secret to Easily Attaining a Healthy, Leafless Lawn in our recent article. Blow them – If you are totally allergic to raking leaves, then try blowing them into your flower beds and around trees. You can also blow them onto a tarp to make them easier to bag or even better – add to your compost pile. Vacuum them – Consider renting a vacuum machine with a shredding feature. You can use a bag attachment and easily distribute the shredded leaves around your yard. Vacuum machines are fairly quiet, too. Mow them – Instead of bagging leaves and putting them to the curb, mow over them with a mulching mower. The mulched leaves can be left on your lawn to absorb back into the soil. You should see roughly 50% of the grass through the mulched pieces of leaves. Mulch them – Add a bag attachment to your mulching mower and presto, you have mulch that you can spread throughout your landscape. Apply a 3-6” layer around trees and shrubs and a 2-3” layer in annual and perennial beds. Compost them – You can also add your leaves to your compost bin. Mulched leaves will decompose faster than whole leaves. Till them – Blow all your leaves into your vegetable garden area and then till the leaves into your soil. For heavy clay soils, till a 6-8” layer of leaves into the dirt to improve aeration and drainage. Eat them – Not you, but a rent-a-goat. Yes, there is such a thing. A goat herder will bring their herd to your yard and turn those little eating machines loose. Soon, no leaves. You won’t wake the neighbors up with these guys. Win-win. Why go and buy bags of compost when you have plenty falling from your trees every fall day? It only takes a little creative leaf management to recycle them into usable nutrients for your lawn and gardens. Think of how green and healthy your lawn and plants will be thanks to all your fall leaves. Now go ask your neighbor for his bagged leaves. We have mulch to make! 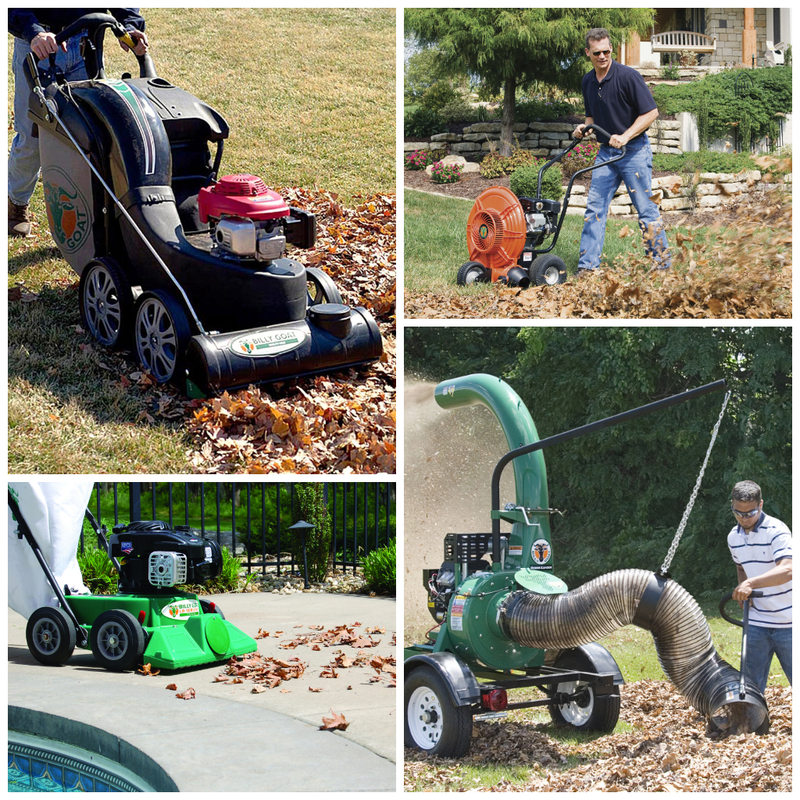 Our expert staff is always on hand to help you with your fall clean-up and winter preparation projects. From blowers and leaf vacuums to mulching mowers and tillers, if you have any questions about what to choose, pricing or how-to’s, don’t hesitate to contact us. Stop by our store — we’re open seven days a week. Your grass is stressed out! When you’re a little frazzled and stressed out, the phrase “just breathe” comes to mind. A calming, deep breath does wonders for making things feel so much better. That same principle can work for your tender grass. After a long, hot summer and plenty of foot traffic, it needs a good dose of oxygen to prepare it for next spring. Aeration is just the solution. Does your lawn need aeration? Not all lawns need aeration especially if you have seeded or re-sod in the last year. Do a visual inspection of your grass and look for brown, thinning patches. You can also dig up a square sample of grass. If the roots are less than two inches deep then you need to aerate. The more matted the root system the better your lawn can fight off weeds and pests. First, get a soil sample done on your lawn. It’s inexpensive and will tell you some of the underlying problems troubling your soil. Next rent a good, core plugging aerator. These aerators work better because they extract the soil plugs from your lawn, leaving behind a small hole. Before you begin the aerating process, deeply water your grass one or two days prior. Apply at least one inch of water, which will help the aerator penetrate the soil deeply. The core plugs will also pull up easier. When do I need to aerate? The time for aerating really depends on the type of grass you have. For cool season grasses like fescue, bluegrass and rye, August through October is when you should aerate. Warm season grasses like Bermuda, Zoysia and St. Augustine should be done April through June. Depending on the type of grass you are growing, you may want to consider slice seeding your lawn to help the existing grass become denser. You can learn more by reading our article about slice seeding. A residential aerator is as easy to use as your lawn mower. You simply push it over your grass and the cores are extracted. Be sure to run the aerator in two different directions to guarantee that you’ve covered the lawn sufficiently. After you have finished aerating, you can leave the core plugs on your grass to decompose, or you can rake them up and add them to your compost pile. Spread compost over your grass and fill in the holes made by the aerator. Our article on aerating and fertilizing your lawn will teach you more. Aeration is an easy way to help your grass improve its overall health. Giving the root system a good old shot of O2 will set you on the course for a greener lawn come spring. Next time you take a deep cleansing breath, remember your grass. After the long hot summer we’ve had, everyone deserves to relax and breathe a little easier. Our expert staff is always on hand to help you with your yard and garden projects. From aerators and slice seeders to grass seed, if you have any questions about what to choose, pricing or how-to’s, don’t hesitate to contact us. Stop by our store — we’re open seven days a week. Properly maintained yard equipment can extend the life of your tools. Winterizing your lawn mower takes only minutes and will pay off tenfold come spring. Next year, at the first sign of warmer weather, you will be ready to venture out and tackle that unruly lawn. Empty the gas tank – Unused gas can become stale and gum up the carburetor. If you prefer to leave gas in the tank, you should fill it up completely to avoid moisture accumulation and add a fuel stabilizer. This will prevent the gas from degrading. Be sure to run the mower long enough to let the stabilizer get into the carburetor. Disconnect the spark plug – This will allow you to work underneath the lawn mower safely. When you remove the plug, pour an ounce of motor oil into the cylinders and crank the engine a few times. This will help lubricate the engine. Another helpful tip: spark plugs should be replaced after every 100 hours of operation. 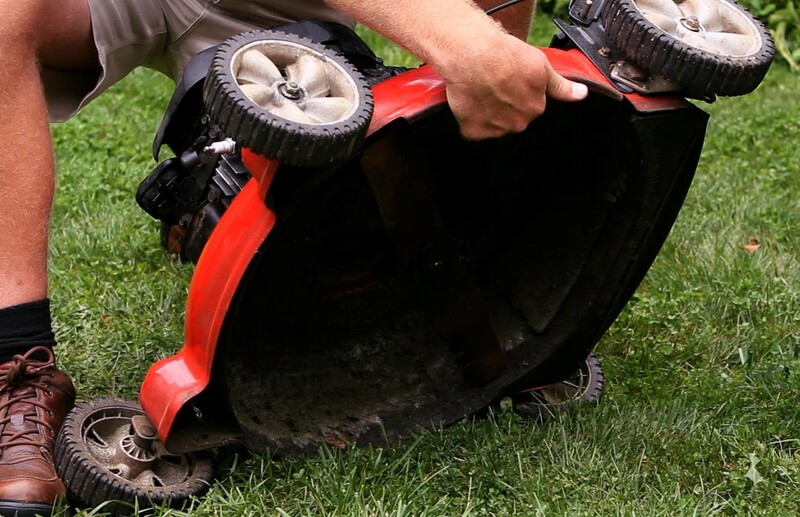 Remove the blade – By removing the blade from underneath, you are able to clean out any remaining grass or mud, as well as have easier access for changing the oil. Sharpen the blade – Lawn professionals recommend that you sharpen your blade monthly during mowing season to avoid damaging the grass with a dull edge. Learn more by reading our blog on how to sharpen your mower blade. Drain and change the oil – Routine oil changes will help extend the life of your motor. You can dispose of the old oil by taking it to a service station or to a repair center. Clean the undercarriage – This will help prevent rust and clear any blockages from the chute. After cleaning, spray it with a silicone spray like Lube-a-Boom Clear to help prevent future build-ups. Change the air filter – A dirty air filter keeps the engine from burning gas efficiently. Follow the instructions in your owner’s manual on how to clean or replace your filter. Charge the battery – If you have a battery-powered starter on your mower then you will want to charge it periodically over the winter. This will help the battery retain a full charge come spring. Store your lawn mower in a dry, well-vented area (especially if you are leaving gas in the tank). Keep it away from heaters or furnaces. Consider removing the newly sharpened blade and storing it separately to avoid injuries. Finally, if you are going to charge your battery over the winter, either remove it for easier access or store the mower near an outlet. Covering your mower is a matter of personal preference. Putting a tarp over it will keep it clean, but it can also attract some unwanted guests. Sprinkle a few moth balls around the outside of the motor to ward off any rodents that might want to build a nest inside. With a little TLC in the fall, you and your favorite lawn companion can rest easy over the cold months. Caring for your lawn mower now will allow you to hit the grass running come spring. Once again man and mower will be ready to tackle the green monster that is your lawn. Long live the mower! From pressure washers to jacks, our expert staff is always on hand to help you with winterizing your lawn and garden equipment. We service a wide variety of Honda Power Equipment including mowers and tillers. For more helpful tips on how to get ready for the cold weather, check out this post: Winterize and Maintain Your Outdoor Power Equipment. As always, if you have any questions about what to choose, pricing or how-to’s, don’t hesitate to contact us. Stop by our store — we’re open seven days a week.